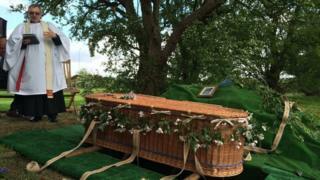 When Rosie Grant's mother died following a terminal illness, she fulfilled her mum's wish to have a personal and unique funeral. "It wasn't the slickest funeral ever, but it was lovely, and so many people contributed in different ways," says Ms Grant. "It started off as an interest for me," she says. "I wanted to help families create their own farewell rituals." After gaining experience as a funeral director, Ms Grant founded Natural Endings in Chorlton, Manchester in 2005. Since then she has organised funerals in barns, pubs and at the deceased's home, and arranged burials at woodland burial sites. There are 270 such locations across the UK. She says: "I spend time with the family of the deceased, and we work out what kind of funeral they want." Ms Grant also specialises in ethical burials, offering natural and biodegradable coffins made from materials such as bamboo, willow and woven pineapple leaves. Her business is a far cry from many High Street undertakers, who follow a traditional checklist involving top hat, black limousines, highly-lacquered wooden coffins, and a solemn service with prayers and a few hymns. However, as a growing number of us demand more choice, a new breed of modern funeral businesses has developed. They are attempting to shake up the funeral sector, estimated to be valued at £1.5bn, according to the National Association of Funeral Directors (NAFD), which represents 3,900 member firms across the UK, and organises funeral industry qualifications, such as a diploma in funeral arranging. "People are increasingly wanting different formats when it comes to funerals," says Mike Owen, chief executive of the NAFD. "They want it to be tailored and have a less religious feel. There's more of a focus on celebrating rather than just having a traditional sorrowful service." She adds: "Many are starting such a business because they've experienced a dreadful funeral for a family member and thought, 'I can do so much better'. "They don't do black, shiny cars and twirling silver canes, unless that's what the family wants." When the bereaved visit one of Green Endings' three branches in London, they might be offered champagne to raise a toast to a family member, or a slice of cake as they sit on the sofa. "We don't want people to feel like they're applying for a mortgage," says Jeremy Smith, who took over Green Endings in 2008 when the previous owner retired. "We want to be more natural, not pompous, and we don't ask if they'd like to see the brass handles [on the coffin] and all that horrible nonsense, when someone has died," adds the 55-year-old. "We want to treat people properly." "In the 15 years I've been working in this business, I've seen the rise of the green burial site as a key trend," says Mr Smith. "There's so much more interest in being buried in a natural environment without regimented lawns and marble memorials." Back in 2014 his company organised the funeral for Only Fools and Horses actor Roger Lloyd-Pack, more fondly remembered as "Trigger". Mr Lloyd-Pack was buried in London's Highgate Cemetery in a woven coffin. With the average price of a funeral in the UK rising by 3.9% to £3,702 over the past year, according life and pensions group Royal London, the sector can be a financially rewarding one to work in. While some industries feel the strain during a recession, even in tough times the funeral industry holds up, says Ms Owen. "In some cases families do get into debt [when arranging a funeral], as they prefer to give a good send off," she adds. "So they'll spend a few hundred pounds more, even if they have to pay for that through credit for a few months." For Green Endings, the rising demand for alternative types of funerals has spurred the company to expand - the business opened its third branch in November, and is set to launch its fourth in east London this year. To help shatter the taboo around death, and inspire people to think creatively about the type of funeral they want before they die, former fashion editor Louise de Winter launched Poetic Endings, a funeral planning service, back in November. "I'd reached a point where I want to do something with meaning, and when my granddad died a few years ago, that was my first firsthand experience of a funeral business," she says. "I was appalled by what I experienced. It was traditional, dry, everything about it was stuffy. "The idea [of Poetic Endings] is that people spend some time thinking about how they would like their funeral to be," adds Ms de Winter, who also hosts death cafes, where strangers come together to talk about death and dying. "It's not just about the service, it's about thinking about which funeral directors you'd like to use, what's important to you, how much you want your family to spend. It makes you more aware of the options you have." While there's many intense challenges to being a funeral director, chiefly being on call 24/7 and constantly dealing with grief, for many it's a vocation. Ms Grant says: "I feel like I make a difference supporting people at a difficult time. "I consider myself lucky that I have a job I love and I know my mum would have been proud."